Kingsport Police Department Detectives are soliciting citizen tips in an investigation into an auto burglary and resultant stolen firearm. On February 8, 2018, a customer was returning to his vehicle in the parking lot of Walmart, located at 2500 West Stone Drive in Kingsport, when he noticed a white male suspect standing at the driver’s door of his vehicle. When the suspect spotted the customer, he fled, jumped into his own vehicle, and sped out of the parking lot. The customer immediately checked his vehicle and noticed that his 9mm pistol had been stolen from the interior. He told police that he had most likely left his vehicle unlocked. 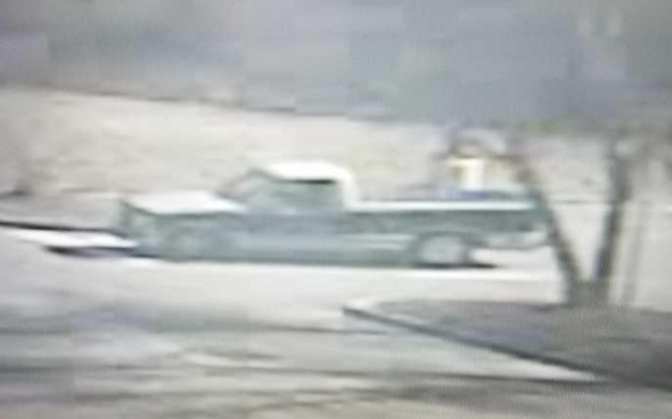 The vehicle in which the suspect fled was described as possibly a 1990s model full-size Chevrolet pickup with a two-tone silver paint scheme. A blurry photograph, taken from Walmart parking lot surveillance footage, has been included in this release. Anyone who recognizes this vehicle or who may know the potential identity of the owner or operator is asked to contact the K.P.D. Criminal Investigations Division at 423-229-9429 or call Kingsport Central Dispatch at 423-246-9111. The Kingsport Police Department continues to alert citizens that the vast majority of auto burglaries are crimes of opportunity due to the vehicle being unlocked, an item of value being left in plain sight, or a combination of both of these two factors. K.P.D. advises against the storing of firearms in a motor vehicle, even if it is locked, but strongly discourages ever leaving a firearm in a vehicle that is unlocked.